Election officials in Elmore tally results for a vote over a new fire truck. Justin Lindholm and Ann Singiser wait to check in voters in Mendon on Tuesday. A scene of Jamaica's town meeting on Tuesday. Nancy Dean, chair of the Norwich Board of Civil Authority, shares a quiet chat with John Lawe at Norwich's polling place in Tracy Memorial Hall on Tuesday morning. It was standing room only as moderator Bob Baird led Chittenden's informational town meeting Monday night. More than 60 people showed up. It's Town Meeting Day 2019, and VPR is keeping an eye on what's going on around Vermont today. Bookmark this page and stick with us as we bring you updates from around the state. Want more? Follow us on Twitter: @vprnet. We'll also have a few extra newscasts on the air this evening, plus a look at town and school budget results online. Find VPR's Town Meeting Day coverage here. Got an update or result from your community to share with us? Send an email. And with that update, it's late so I think we're going to shut this down for the time being. I removed "Live" from the headline, so you know it's official. 9:24 p.m. — Howard Weiss-Tisman recently spoke with 17-year-old Rio Daims, who had been working to get a youth vote measure on the ballot in Brattleboro. This Town Meeting Day, an item that would allow 16- and 17-year-olds to vote in local elections was indeed on the ballot in Brattleboro, and per the town website posted unofficial election results (h/t NBC5's Brian Colleran), the article passed. 9:04 p.m. — VPR's John Dillon had written earlier this week about a proposed charter change in Montpelier to be able to set energy efficiency standards, and VTDigger reports that the measure did pass in the capital city — however not by much. And switching to school news, NBC5's Brian Colleran reports that Cabot voted against closing its high school. 8:27 p.m. — OK, now we have the Morristown name news... and it was a close one, as Amy Kolb Noyes reports. Voters have passed the nonbinding resoluation to change the name of Morristown by just a 30-vote margin. 8:09 p.m. — The Rutland Herald is reporting that Mayor David Allaire has won re-election. Allaire was elected mayor of Rutland in 2017, when he unseated then-Mayor Christopher Louras. 7:58 p.m. — We have an update from Morristown. No word yet on the name change, but there is a new town moderator whose name is likely familiar statewide: former Vermont House Speaker Shap Smith. 7:36 p.m. — Some news from Vermont's largest city, as Burlington Free Press reporter Jess Aloe reports that Jane Knodell has lost re-election to Progressive candidate Perri Freeman. In VPR's conversation with Seven Days reporter Katie Jickling before Town Meeting Day, Jickling explained how Knodell did not get the Progressive endorsement and had decided to run as an independent in this race. 7:27 p.m. — Elmore is getting a new fire truck. VPR's Amy Kolb Noyes reports that Elmore voters approved purchasing a new fire engine by a vote of 113 to 73. For more on the debate leading up to this vote, check out Amy's story here. 7:20 p.m. — A few updates coming in from Winooski (h/t Seven Days' Andrea Suozzo on Twitter), but unofficial results show Kristine Lott has been elected the new mayor and that the proposed parking garage received voter approval. 7:02 p.m. — OK, we've made it past 7 p.m. That's when polls in Vermont close, and we're waiting for some more results to come on in. Stick with us here online, plus tune in for a few extra newscasts toward the top of the hours this evening on the air. A cake in Mendon sends "Thanks for Voting" wishes. It's after 7 p.m. in Vermont which means polls are closed. 6:00 p.m. — One hour until polls close in Vermont! 5:26 p.m. — We're seeing updates about town and school budgets passing trickling in, so wanted to mention that our 2019 town and school budgets results post is up and running. The (searchable) table is a bit sparse at the moment but, especially once polls close, we're planning more updates for tonight. Chittenden is one of the Vermont towns asking voters to consider a climate change referendum this Town Meeting Day. VPR's Nina Keck reports that it stirred up some debate at Monday night's informational meeting. 4:52 p.m. — As VPR's Nina Keck reports, there are a number of towns in Vermont asking voters to consider a climate change referendum this Town Meeting Day, including Chittenden, Shrewsbury, Middlesex and Castleton. It's part of an effort organized by 350Vermont, which saw resolutions passed in more than 30 communities last year. 3:19 p.m. — As you may have observed, we've hit a bit of a lull here in the blog updates — though certainly expect things to pick back up, especially once polls close. Now though seems like a good time to mention that today's Vermont Edition broadcast, which looked at access to voting in the area, has now been posted online if you're looking to catch up on it. It will also be rebroadcast tonight at 7 p.m. If you're generally curious about the responsibilities of fence viewers, there's a chapter in Vermont statute that goes into more detail about the position. 1:30 p.m. — We have five-and-half-hours to go until polls close in Vermont this Town Meeting Day (polls close at 7 p.m.). 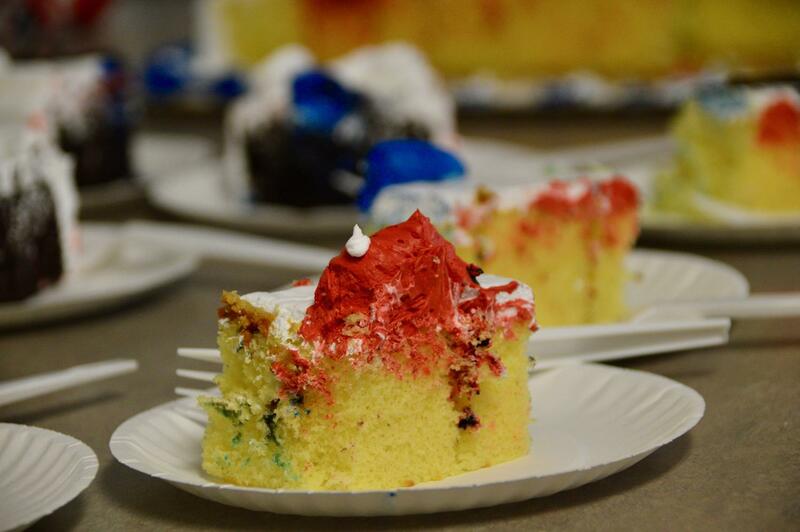 A slice of cake in Mendon on Town Meeting Day. Curious to hear from other Vermonters: Is this something that your town does already (or is looking to do)? 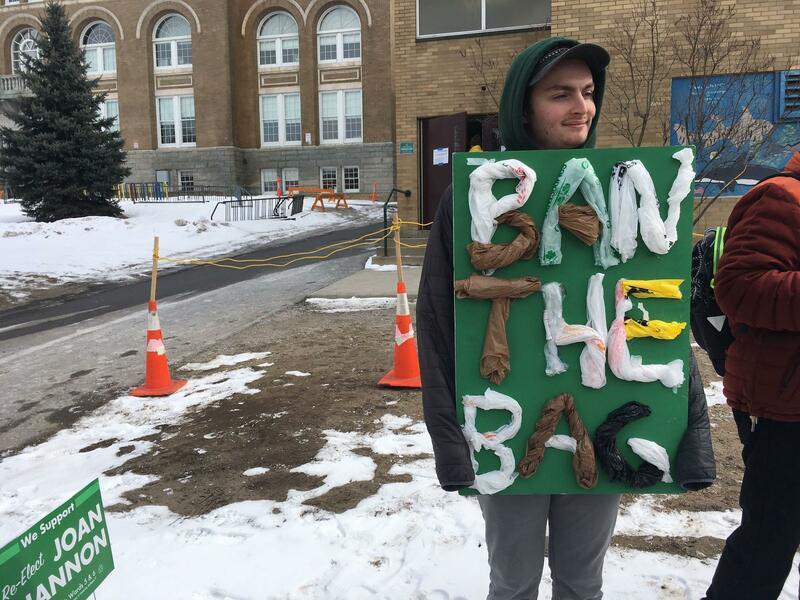 12:20 p.m. — In Burlington, Liam Elder-Connors came across Miles Raport who was wearing a "Ban The Bag" sign to show support for an advisory item on the Burlington ballot that calls for a ban on single-use plastic bags. Miles Raport stands outside the Ward 6 polling place in Burlington, wearing a "Ban The Bag" sign. (Correction 2:10 p.m. - A previous version of this caption said Raport was at Ward 3). Burlington isn't the only town that is asking about single-use plastic bags this Town Meeting Day — as VPR's John Dillon noted in his reporting late last month, the towns of Manchester and Middlebury are also holding votes. 11:53 a.m. — VPR's Howard Weiss-Tisman is in Jamaica on this Town Meeting Day morning. He reported that Jamaica residents voted 57-29 in support of doing more exploratory work on building a municipal water system for the small Windham County town. Jamaica residents line up Tuesday to vote by paper ballot on water project. 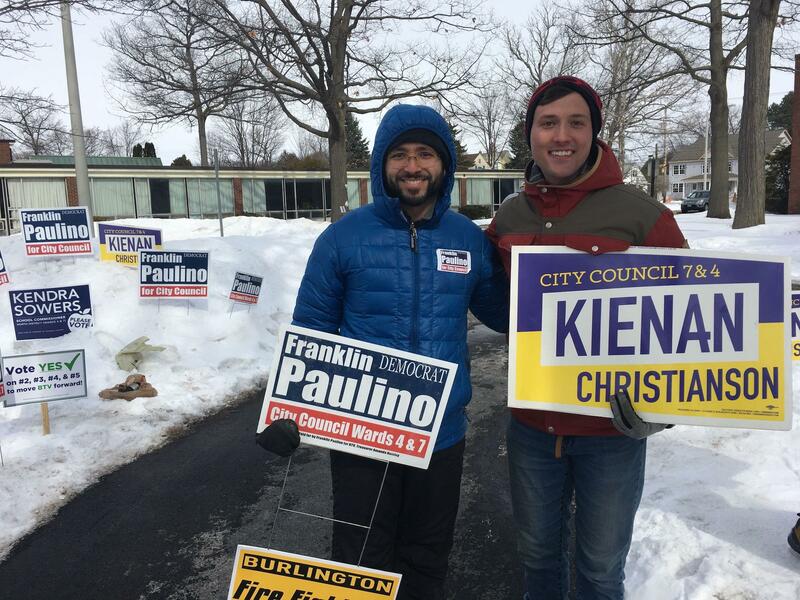 Burlington City Council candidates Franklin Paulino, left, and Kienan Christianson, hold up their respective signs on Town Meeting Day. 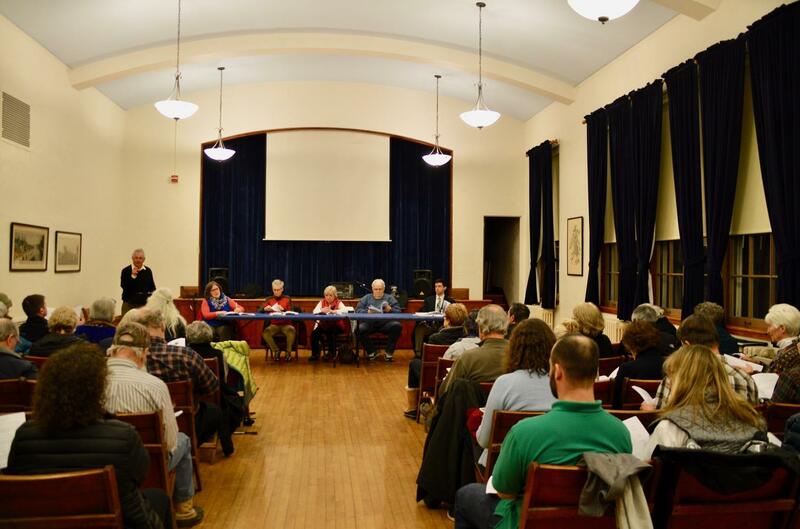 Want to know more about what's on the Burlington ballot this Town Meeting Day? We talked to Seven Days reporter Katie Jickling for a look at the city's ballot items. And this feels like a good time to remind you that there's bunch of local media outlets following results today. We'll try to highlight some of our fellow VT media here in the blog, but also check out the #TMDVT hashtag on Twitter to see who's posting there! 10:51 a.m. — School meetings are taking place this Town Meeting Day, and VPR's John Dillon has been to a couple this morning. Earlier he was in Calais, before heading to East Montpelier — both are within the Washington Central Supervisory Union. 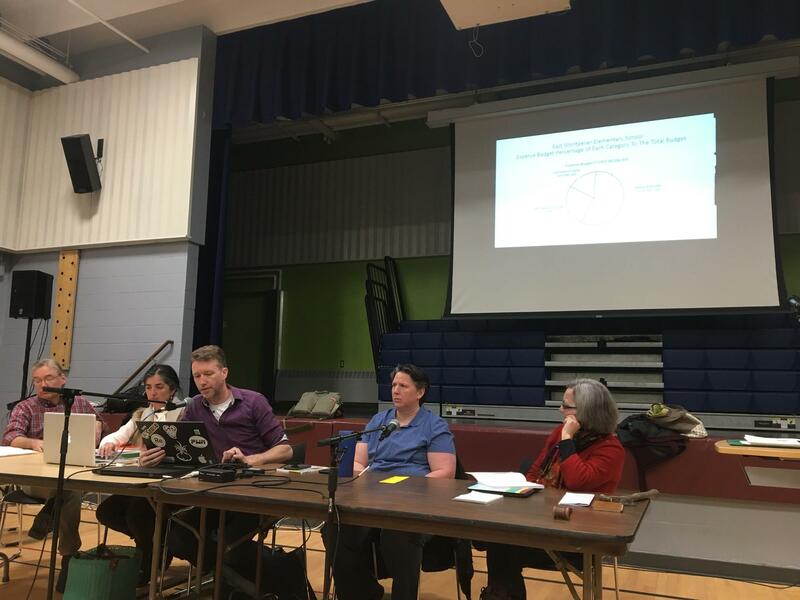 The forced merger involving these districts to create a new unified district is complicated by the debt of East Montpelier, which under the merger would be shared by other towns. And in case you missed it: In a ruling yesterday, a Franklin County judge denied a request from a group of school districts for a temporary injunction to stop mergers required under Act 46. A scene from Tuesday morning's East Montpelier school meeting. 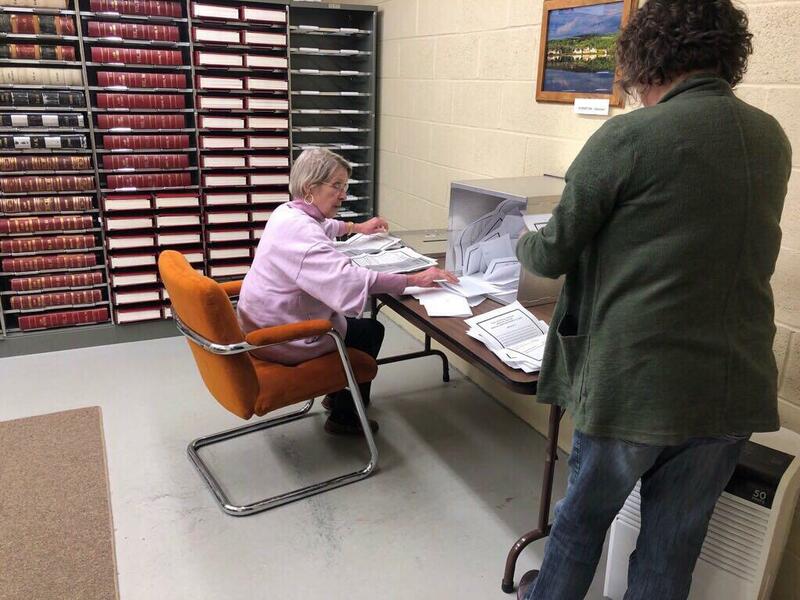 10:21 a.m. — In Wolcott, there was a contested race for town clerk: Assistant Town Clerk Belinda Clegg, who has served for 29 years as assistant to Town Clerk Linda Martin, was running against her boss in this election. The outcome of that race was decided Tuesday morning. As Amy Kolb Noyes reports, Martin retained her role as town clerk by a vote of 81-42. 9:53 a.m. — Earlier today you may have heard Amy Kolb Noyes' story on Morning Edition, in which she discussed the debate in Elmore over the purchase of a new fire truck. Voters there have until the polls close tonight to weigh in on the ballot item. And in Shelburne, as VPR's Sarah Ashworth explains, members of the Shelburne Fire and Rescue departments were pushing for passage of Article 8. That would have the town enter a purchase agreement for land to build a new combined fire and rescue station on a site with Healthy Living Market & Cafe. Members of the fire department gather outside Shelburne Town Hall on Town Meeting Day to advocate for passage of Article 8. Meanwhile Amy Kolb Noyes stopped by Wolcott where it turns out there is a special crossword puzzle available. Perhaps this will catch on statewide for TMD20?! Candidates on the Winooski #TMDVT ballot outside the senior center. 7:48 a.m. — Good morning, people of Vermont! Welcome to Town Meeting Day 2019! As noted, this is our live blog. It will probably be busier once polls close (which is at 7 p.m.) and results are coming in, but throughout the day we'll also try to include some updates and scenes from around the state here. 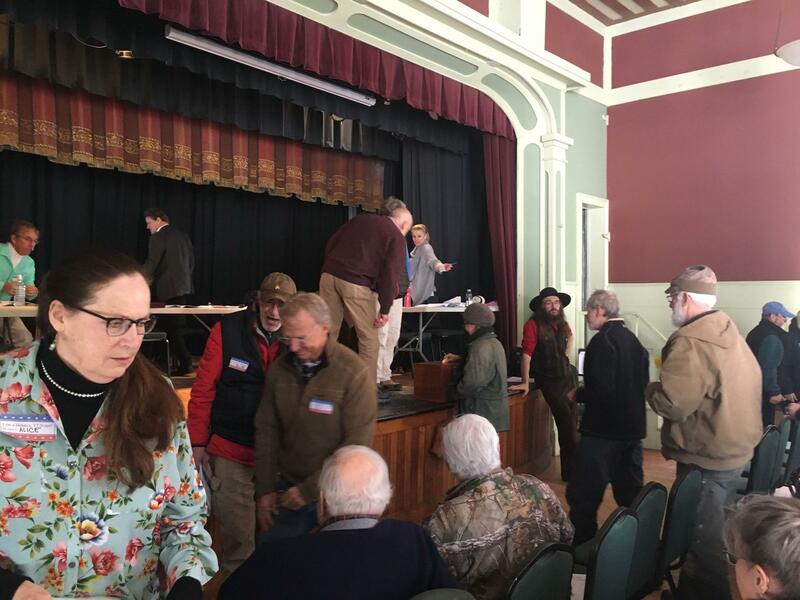 Town Meeting Day reminds Vermonters of how we vote in our unique form of local democracy, but the question of who gets to vote — in elections and at Town Meetings — continues to change. We're talking about how.